Despite WordPress assigning this post as p1177, this is in fact the 757th post! Yes, it's time for another one of our really hated loved Useless Rubenerd Blog milestones! Given the fact I'm in the 700+ range of posts, there are some posts which have the same number as famous Boeing airliners. Being a huge fan of commercial aviation, I figured I'd create some small posts about these planes. I missed the boat on the 707/720 and 727 (no, I'm sorry the 717 was the MD-95!) but I did do posts on the 737 and 747. 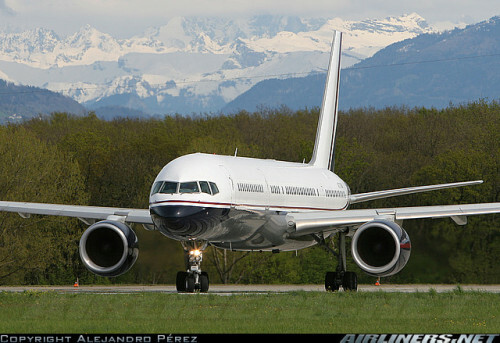 The 757 was first introduced by Boeing in 1983 to replace the aging 727 trijet for short to medium range flights. Its narrow body design had similar cross section dimensions to the 707/720, 727 and 737 and was able to service hot and high climates. Despite production ending in 2004, 1,019 of the 757's built out of 1,050 are in active service, mostly in North America and Western Europe. The capacity bracket the 757-200 served has since been replaced by a stretched and extended range version of the 737, the 900ER. The -300 series will be replaced by the 787 Dreamliner. A defining feature of the 757 was its common cockpit and avionics design with the 767, meaning a pilot trained to fly one could learn to fly the other in a very short amount of time. In relation to it's size, the 757 also has a very high ground clearance, especially when it's in the air (that was me trying to make a funny), perhaps after lessons learned from trying to fit wide turbofans onto a low ground clearance plane such as the 737. From a purely engineering standpoint, and to use the very technical language that people in the Illuminati use to describe commercial aircraft, to me 757s always looked like pug dogs from the front. And the angle of the windows makes them look cross. Is that just me?